Did the other actors make you feel welcome right away? Absolutely. It was definitely a daunting feeling to come on set with all of the Avengers, because for the majority of the cast this is their third or fourth film. So theya��re very comfortable with each other and with the way they want to portray their characters. Everyonea��s super friendly and down to earth, and ita��s a very grounded set. The environment we work in is family oriented. Robert (Downey Jr) did a lovely thing recently: two nights before we all had a big scene together and he called a cast dinner together, so we could just catch up. It was really nice. 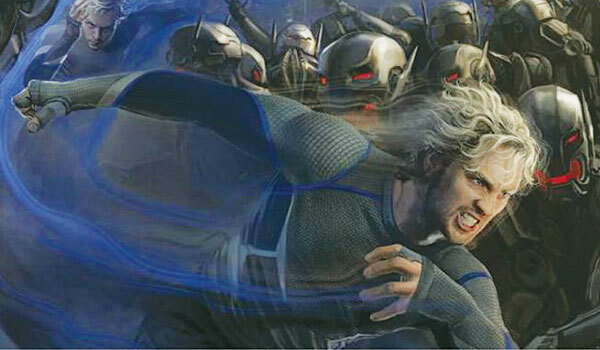 When the movie begins, where do we find Quicksilver and his sister Scarlet Witch? Ita��s great that I came on with Witch. In this film, my roleA� continues from where it left off at the end of Cap 2a��where we did a little tag, experimenting in Hydraa��s basement and seeking revenge on Tony Stark because of what wea��ve been through in the past. My character has super speed and Elizabetha��s has psychological powers. Tell us about Quicksilvera��s powers. Quicksilvera��s superpower is being as fast as the speed of sound, but hea��s also quick at everything else. Hea��s quick tempered and becomes frustrated with everything. You couldna��t really have Quicksilver without Scarlet Witch. They balance each other out. We do these Eastern European accents. Wea��ve done dialect sessions together so we could sound the same, especially because Ia��m English and Elizabetha��s American. How did the costume designer, Alexandra Byrne bring your character to life? Yes. Byrne is fantastic. One thing that (director) Joss wanted was never to see Pietro (Quicksilver) in the same pair of shoes twicea��as hea��d just burn them out and then pick up another pair somewhere else. His trousers are very much like a motocross bikera��s jeans. Theya��ve got padding in the knees and the lining to protect hima��like if he was running in the woods and hea��d gotten nicked by a tree or something because hea��s going so fast. If you could have another Avengera��s powers for a day, which one would it be? Probably one of the most impressive, physicality wise, is Thor. As a god, hea��s like six foot something; hea��s huge. His arms are the size of my thighs and hea��s got a hammer that can fly and make thunderstorms. How is it working with Joss Whedon? Joss is the ultimate Avenger. He is the team leader. He can see behind everyonea��s eyes. Ia��d like to see him when hea��s writing, just being some schizophrenic man, talking to himself in five or six different kinds of characters. Hea��s genius. I rely on him and put all my trust in him. Hea��s just open to talk about everythinga��our thoughts and ideas. Hea��s brilliant. Avengers: Age of Ultron is releasing today.